Southern California is home to the best theme parks in the world, beautiful beaches and a constant stream of sunshine. It’s too perfect to only visit once, so it make it your yearly vacation destination by becoming a timeshare owner. There are WorldMark Dolphin’s Cove timeshares for sale, which can be purchased with a click of a button. There is never a dull moment at the Dolphin’s Cove Resort. There is a festival or event occurring in Anaheim nearly every month of the year. Visit in April for the Renaissance Pleasure Fair or stay in October to celebrate Oktoberfest. The resort offers one, two and three bedroom condo options. All options include a full kitchen and a balcony or terrace, depending on which floor level you choose with your Dolphin’s Cove fractional ownership. Units include flat-screen TVs and free WiFi. Purchasing a WorldMark Dolphin’s Cove timeshare resale is like becoming a member to an exclusive club. This family-friendly destination offers a kid’s pool, a playground fitted with up-to-date equipment, a game room and daily children’s activities at the recreation center. A perfect spot for an afternoon picnic can be found at the BBQ grill area. The Dolphin’s Cove timeshare deals offered by Premier Timeshare Resale can make your dream vacation a reality. Imagine it: a morning trip to the fitness center should be followed up by an afternoon at the resort’s full-service spa. Choose to spend daytime at the heated outdoor pool and the evening in the outdoor hot tub. Finish off the day with a game of mini-golf, located on the resort grounds. The resort is located in a town designed with vacationers' needs in mind. With multiple theme parks, shopping centers and restaurants, WorldMark Dolphin’s Cove timeshare owners are situated in the midst of Southern California’s main attractions. Disneyland Park and Disney California Adventure Park are less than two miles away from Dolphin’s Cove. Both parks offer one to five-day passes. Only a ten-mile drive from the resort, Knott’s Berry Farm offers one of the first 4D-amusement rides in the country. Spend a day at the beach, soaking in the rays and learning to surf. WorldMark Dolphin’s Cove Resort is a 30-minute drive from some of the most sought after beaches in the world. Huntington Beach is a popular destination for tourists, offering many shops and attractions along the boardwalk. Less than thirty miles from the resort, Laguna Beach offers a more isolated and relaxing experience. If southern California is your ideal vacation destination, then bring your fantasy into existence by buying a Dolphin’s Cove timeshare. Fractional ownership offers you the freedom that isn’t included in traditional vacation home ownership. 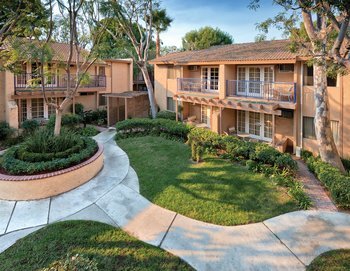 WorldMark Dolphin’s Cove resales through Premier Timeshare Resale will make Anaheim your home away from home. Already a current timeshare owner? Allow Premier Timeshare Resale to assist you with selling a Dolphin’s Cove Resort timeshare. Contact one of our agents today.